The Peace of Thorn of 1466 was a peace treaty signed in the Hanseatic city of Thorn (Toruń) on 19 October 1466 between the Polish king Casimir IV Jagiellon on one side, and the Teutonic Knights on the other. 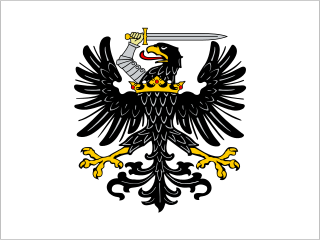 Royal Prussia or Polish Prussia was a region of the Kingdom of Poland from 1466 to 1772. Prussia is a historical region in Europe, stretching from Gdańsk Bay to the end of Curonian Spit on the southeastern coast of the Baltic Sea, and extending inland as far as Masuria. The territory and inhabitants were described by Tacitus in Germania in AD 98, where Suebi, Goths and other Germanic people lived on both sides of the Vistula River, adjacent to the Aesti. 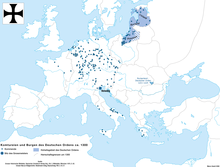 About 800 to 900 years later the Aesti were named Old Prussians, who, since 997, repeatedly defended themselves against take-over attempts by the newly created Duchy of the Polans. The territory of the Old Prussians and neighboring Curonians and Livonians was unified politically in the 1230s as the Teutonic Order State. 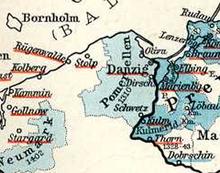 Prussia was politically divided between 1466 and 1772, with western Prussia under protection of the Crown of Poland and eastern Prussia a Polish–Lithuanian fief until 1660. The unity of both parts of Prussia remained preserved by retaining its borders, citizenship and autonomy until western and eastern Prussia were also politically reunited under the German Kingdom of Prussia. It is famous for many lakes, as well as forests and hills. 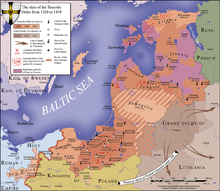 Since the military conquest of the area by the Soviet Army in 1945 and the expulsion of the German-speaking inhabitants it was divided between northern Poland, Russia's Kaliningrad exclave, and southwestern Lithuania. 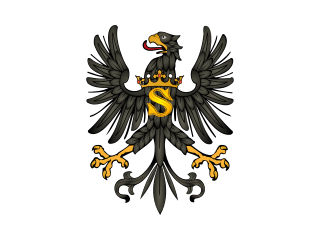 The former German kingdom and later state of Prussia (1701–1947) derived its name from the region. 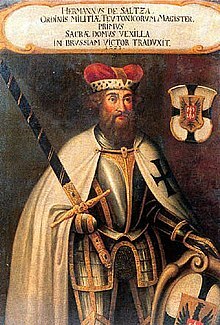 Ulrich von Jungingen was the 26th Grand Master of the Teutonic Knights, serving from 1407 to 1410. His policy of confrontation with the Grand Duchy of Lithuania and the Kingdom of Poland would spark the Polish–Lithuanian–Teutonic War and lead to disaster for his Order, and his own death, at the Battle of Grunwald. Hermann von Salza was the fourth Grand Master of the Teutonic Knights, serving from 1210 to 1239. A skilled diplomat with ties to the Holy Roman Emperor and the Pope, Hermann oversaw the expansion of the military order into Prussia. 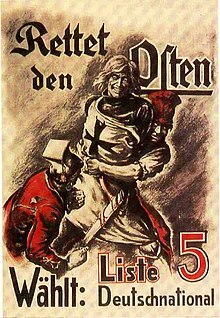 The State of the Teutonic Order, also called Deutschordensstaat or Ordensstaat in German, was a crusader state formed by the Teutonic Knights or Teutonic Order during the 13th century Northern Crusades along the Baltic Sea. 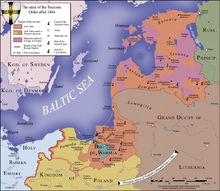 The state was based in Prussia after the Order's conquest of the Pagan Old Prussians which began in 1230. 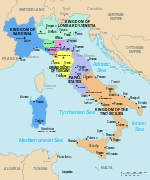 It expanded to include at various times Courland, Gotland, Livonia, Neumark, Pomerelia and Samogitia. 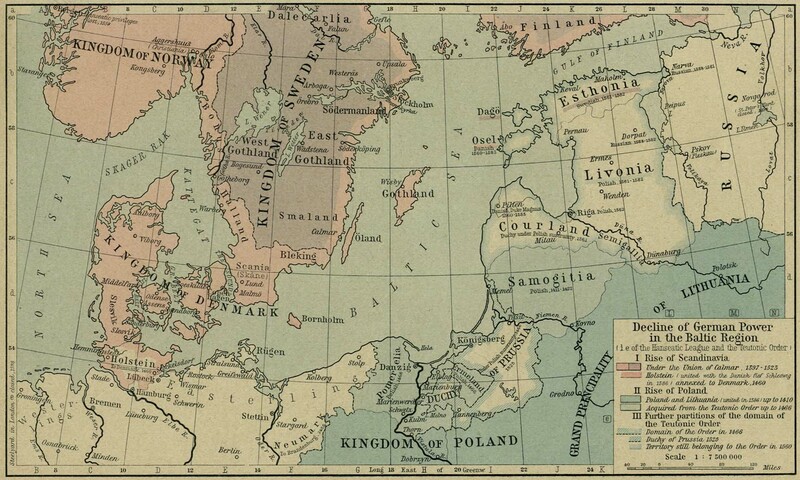 Its territory was in the modern countries of Estonia, Latvia, Lithuania, Poland, Russia and Sweden (Gotland). Most of the territory was conquered by military orders, after which German colonization occurred to varying effect. The Grand Master is the holder of the supreme office of the Teutonic Order. It is equivalent to the grand master of other military orders and the superior general in non-military Roman Catholic religious orders. 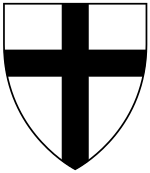 Hochmeister, literally "high master", is only used in reference to the Teutonic Order, as Großmeister is used in German to refer to the leaders of other orders of knighthood. 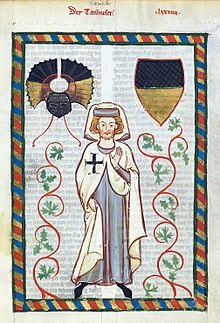 Heinrich von Plötzke was an officer of the Teutonic Order during the late 13th and early 14th centuries. Born in Płock (Plotzk) in the independent Duchy of Masovia,, he was a descendant of the hereditary dukes of Plock but never took the formal title due to the conflict of his family with the ruling Piast dynasty of Poland. 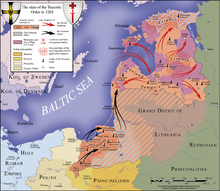 Polish–Teutonic War (1326–1332) was the war between the Kingdom of Poland and the State of the Teutonic Order over Pomerelia, fought from 1326 to 1332. 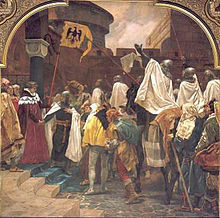 The city of Danzig (Gdańsk) was captured by the State of the Teutonic Order on 13 November 1308, resulting in a massacre of its inhabitants and marking the beginning of tensions between Poland and the Teutonic Order. Originally the knights moved into the fortress as an ally of Poland against the Margraviate of Brandenburg. However, after disputes over the control of the city between the Order and the King of Poland arose, the knights murdered a number of citizens within the city and took it as their own. 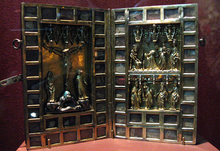 Thus the event is also known as Gdańsk massacre or Gdańsk slaughter. Though in the past, a matter of debate among historians, a consensus has been established that many people were murdered and a considerable part of the town was destroyed in the context of the take-over. The Prussian Crusade was a series of 13th-century campaigns of Roman Catholic crusaders, primarily led by the Teutonic Knights, to Christianize under duress the pagan Old Prussians. Invited after earlier unsuccessful expeditions against the Prussians by Christian Polish kings, the Teutonic Knights began campaigning against the Prussians, Lithuanians and Samogitians in 1230. By the end of the century, having quelled several Prussian Uprisings, the Knights had established control over Prussia and administered the conquered Prussians through their monastic state, eventually erasing the Prussian language and pre-Christian religion by a combination of physical and ideological force. Hermann Balk, also known as Hermann von Balk or Hermann Balke, was a Knight-Brother of the Teutonic Order and its first Landmeister, or Provincial Master, in both Prussia and Livonia. From 1219 to 1227, he served as the Deutschmeister in the Order's Province of Alemannia. Balk led the crusaders during the Prussian Crusade and became Master of Prussia in 1230. From 1237 to 1238, he also served in the additional role as Master of Livonia. The Thirteen Years’ War, also called the War of the Cities, was a conflict fought in 1454–66 between the Prussian Confederation, allied with the Crown of the Kingdom of Poland, and the State of the Teutonic Order. Konrad von Wallenrode was the 24th Grand Master of the Teutonic Knights, serving from 1391 to 1393. Modern sources are friendly towards Konrad, although they claim he was hot-blooded, proud, and had tendencies to be cruel.